In January 1979 the Shah of Iran was deposed and on 22 October he travelled to America for treatment for cancer. 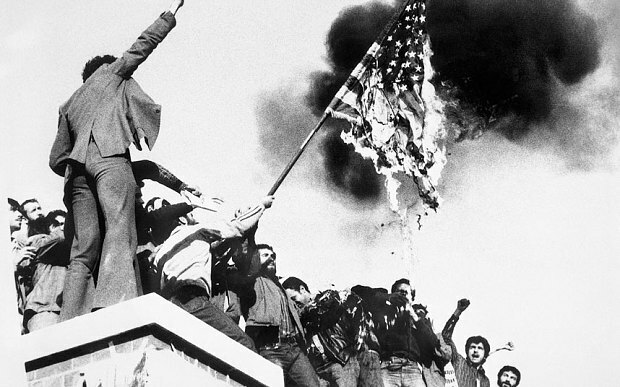 In Teheran the action infuriated Muslim students, several hundred of whom stormed the American embassy, taking 66 diplomats hostage. On 14 November 1979 President Jimmy Carter froze $8 billion of Iranian assets in America. Thirteen black and female embassy staff were released. Another hostage, Vice Consul Richard Queen, 28, was released on 11 July 1980 after he was diagnosed with multiple sclerosis. It was to be the start of 444 days of captivity for the 52 remaining hostages. The White House Christmas tree in 1979 was left dark except for the star on the top. The treatment meted out to the hostages was not always good —one man was handcuffed for 24 hours a day for a fortnight for insulting Ayatollah Khomeini. On 5 February 1980 the hostages were told to strip to their underwear and then subjected to a mock execution. On 24 April 1980 President Carter authorized a rescue mission, codenamed Operation Eagle Claw, but it was a disaster and eight soldiers died. President Carter agreed to unfreeze Iranian assets and not to interfere internally in Iran. The crisis and the failed rescue mission was a blow to his credibility and he lost the November 1980 presidential election to Ronald Reagan (search the article). An agreement, the Algiers Accords, was signed on 19 January 1981 at Algeria. The hostages were freed shortly after President Reagan’s inauguration on 20 January 1981 and flown to Algeria and then to Rhein-Main Air Base in West Germany where President Carter met them.